Taste from a wide variety of over 120 spirits from across the Northwest, the Country and the Globe at the 5th Annual TOAST, The Original Artisan Spirits Tasting. Whether your spirit preference is Whiskey, Rum, Gin, Vodka, Tequila, Brandy, Liqueurs – or even unique spirits like Absinthe and Aquavit – the estimated 40 distillers and producers will have it covered. Distillers and owners will be on hand to pour samples and discuss their craft, while you enjoy the fruits of their labor. The Great American Distillers Festival 2013! Many of the Oregon Distilleries along the trail will be participating at this year's "Great American Distillers Festival." So make sure to get your tickets now to taste some wonderful spirits from Oregon and the rest of the country. If you hadn't heard, the event is a gathering of 40+ craft distillers from across the country who come to Oregon - the Mecca of craft distilling, to share their products, their passion and their expertise in handcrafting spirits. There will be tastings, an awards competition and a mixology contest for bartenders and more! The Oregon Distillers Trail begins and ends at Troutdale, Oregon on Saturday, July 13th at the historic McMenamins Edgefield. Guests can stroll around the meadow at Blackberry Hall and sample from more than 100 Oregon made spirits from 20+ Oregon Distilleries – and pair those spirited samples with the tasty bites from Black Rabbit Restaurant executive chef Kenny Giambalvo. The event will include bottle sales, an exciting silent auction and fun distillery tours. Add all this to Edgefield’s 102nd Birthday Celebration and you have yourself one amazing festive, filled with Oregon spirits, food, music and the great outdoors at beautiful Edgefield. Event goes from 1-6pm, tickets are $20 in advance and $25 at the door. This month, seven Oregon Distillery Trail members were awarded medals at the American Distillers Institute's Annual Spirits competition in Denver. We're thrilled to see these guys and gals putting Oregon craft distilling on the map. If you haven't already, check out these spirits at the distilleries themselves, local liquor stores, or ask your favorite bartender to shake something up. Aria Portland Dry Gin - Bull Run Distilling Co.
And view all the Oregon Distillers Guild winners on our past winners page. The path of the Oregon Distillery Trail is gleaming with gold, silver and bronze medals from past distilling/spirit competitions. Survey our winners circle for a wide range of recognizably delicious spirits from the Oregon Distilling Guild members. Taste from a wide variety of over 150 spirits from across the Northwest, the Country and the Globe. Whether your spirit preference is Whiskey, Rum, Gin, Vodka, Tequila, Brandy, Liqueurs – or even unique spirits like Absinthe and Aquavit – the estimated 50 distillers and producers will have it covered. Distillers and owners will be on hand to pour samples and discuss their craft, while you enjoy the fruits of their labor. This is a fun and educational event that’s not to be missed. 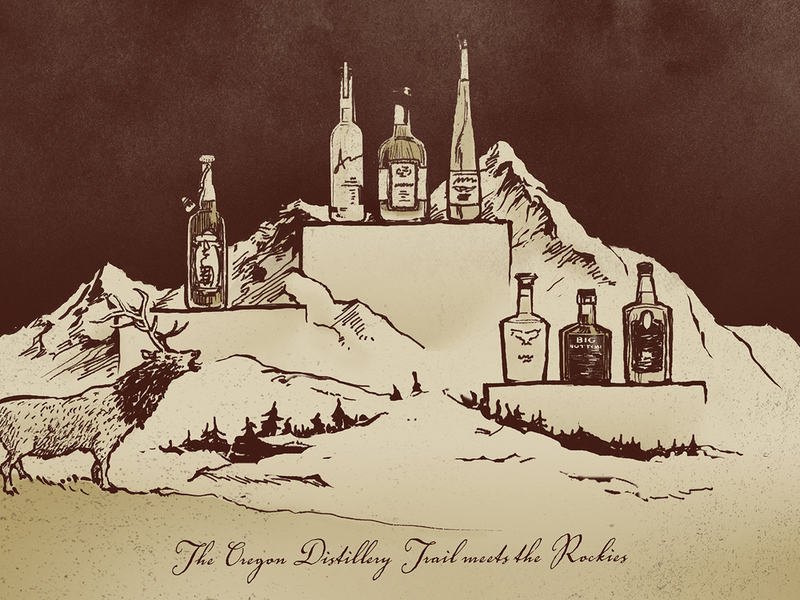 From all of us at the Oregon Distillers Guild, we look forward to seeing you at the Revival.